Kristie and her beautiful felt vessel plus fun dreadlocked wrist cuff! I am going to start this post with a gorgeous picture of Kristie and the beautiful vessel she felted with me at a workshop in Clasheen last Thursday. She used Icelandic wool in shades of green and teal and included some insertions in gold spangled polyester, this created a very interesting and striking effect when these areas were opened up near the end of the felting process. Kristie is one of my blog readers and online friends from America and it was great to share some time with her and three girl pals during their exciting trip to Ireland. She also makes wonderful purses, totes, lunch bags and other custom items and I am now the proud owner of a gorgeous upcycled wallet which matches perfectly the necklace I felted during Evelyn’s workshop and the matching bracelet I completed the following morning!!! I also discovered it also totally compliments the funky wrist cuff I was messing around with yesterday afternoon as I was taking a break from felting the rug (short rug post and loads of pictures to follow tomorrow). This cuff is felted using some woven mohair from Cushendale Woolen Mills as a base and the dreadlocks are inserted using a method of Charlotte’s, SO easy compared to what I would have done before! Upcycled wallet and dreadlocked wrist cuff! 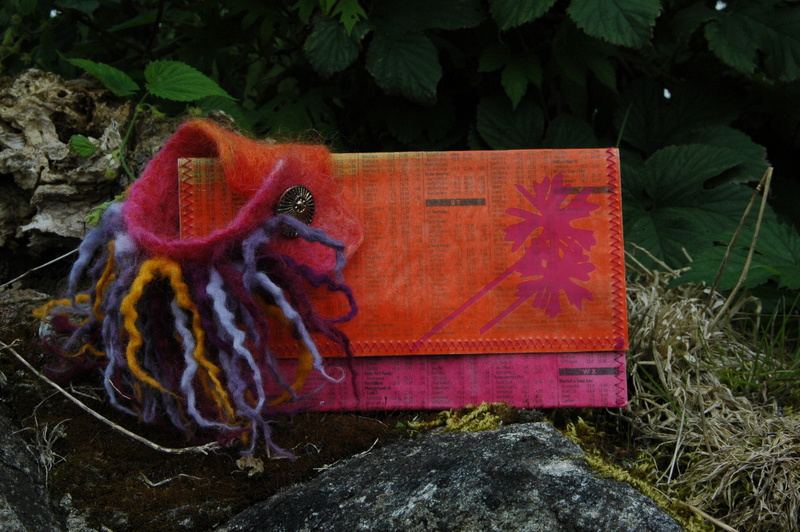 This entry was posted in Felt, workshops and tagged Clasheen, Felt, felt cuff. felt wrist cuff, felt jewellery, felt rug, felt vessel, felt workshop, Felting, wet felt, wet felting, wrist cuff by Nicola. Bookmark the permalink. Looks like a great day was had by all! The upcycled wallet and wrist cuff look as though they were meant to go together. That is so cool! 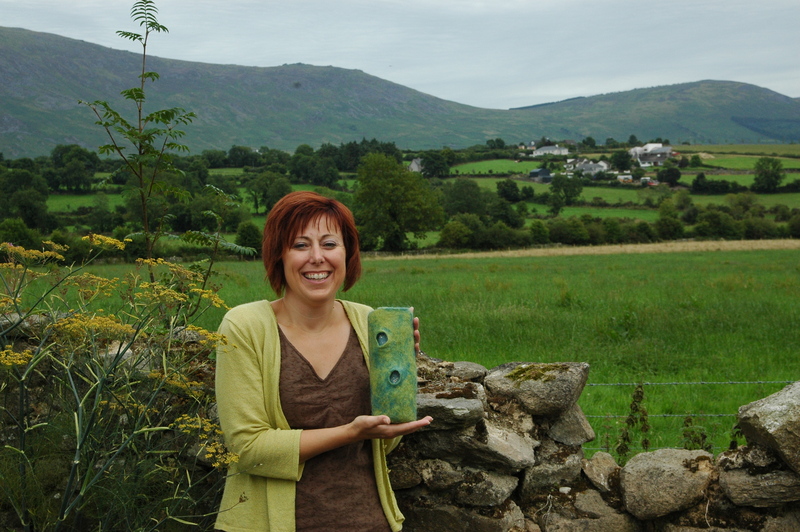 Kristi, I love your vessel….It’s absolutely stunning (as is the Ireland scenery in the background of the photo…wow!). And, you look like you were having the time of your life. I can’t wait until we’re able to get together so I can live/travel vicariously through your pictures. Hope the rest of your trip was amazing, too. Thanks so much for having us in your home. The meal is still the best I’ve had in Ireland. The vessel is amazing and I so appreciate your teaching me your technique. Can’t wait to see you again in Michigan. We’re having an amazing trip and the weather has been stunning. Hope I can come back again.